Start in Bodega Bay, about 30 miles north of San Francisco on CA HWY 1. Stay on CA HWY 1 north to Legget where it will meet US HWY 101 and go north towards Eureka. The Avenue of the Giants is well marked by signs (CA HWY 254) and parallels US HWY 101 for about 35 miles from about 2 miles north of Garberville to about 2 miles south of Scoita. Get back on US HWY 101 for the remainder of the ride to Eureka. The beautiful coastline and the awe inspiring redwood groves. Added by "ridgernr" in April of 2015: "This route begins as a rolling coastal road with sweeping curves and beautiful views of the Pacific Ocean. As you progress northward, it climbs in and out of the mountains with hairpin turns and stunning cliffs above and cliffside views of the pounding surf. Note: Low-hung cruisers are likely to drag running boards on both left and right twisties. Some were tight enough to cause my Garmin to "recalculate" as it thought I turned around. Caution: Locals warn that there are frequent wrecks involving sport bikes gettting in over their head. The turns are THAT tight in places." 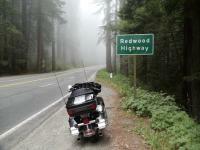 Road winds along the coast and enters the "twisties" north of Westport as you cross the Coast Range to HWY 101. Avenue of the Giants is preferred over the freeway so you don't miss the groves. After crossing the Russian River about 20 miles into the ride you come to historic Fort Ross. Mendicino is a pretty coastal town to wander through. From Leggit to Eureka there are numerous places to stop and wander through the groves of Redwoods. Added by "ridgernr" in April of 2015: "Many small towns with quaint restaurants overlooking the surf. Plenty of gas stops. Scenic overlooks will all be on the left when heading north. Southbound traffic will be looking at the view, not you. Use caution." on January 23, 2012 6 out of 6 members found this review useful. Hwy. 1 north is the ultimate road to ride and you will be worn out at the end of a long day. You'll pass several lighthouses along the route. In the spring or fall is the best time to ride it.....mid summer will always have morning fog. on January 5, 2015 3 out of 3 members found this review useful. An amazing piece of road.I can't believe there are so few reviews of this road.The best part is hanging around this area and riding all the other roads as well.The road quality is great.The scenery is second to none.Can't wait to go back.Stop at bonez smoke house in Gualala and have lunch or dinner.You will not be disappointed with this road! on February 12, 2014 3 out of 3 members found this review useful. This is an incredible ride. Allow a full day to stop at the many scenic rest areas. The road is smooth. Traffic isn't as bad as you see from San Fran to Monterey. It's a little dangerous at times when the scenery is so beautiful that you stop watching the road. Some sharp turns along the coastline with 'infinity-edge' style curves that lack guard railing. Highly recommended. Bring all your gear in case the fog rolls in on you. on May 23, 2015 2 out of 2 members found this review useful. Unsurpassed views of the coast and tons of twisties to make your 243 mile ride an all-day adventure. Not a technical challenging ride, but one where you can have some fun and really enjoy the scenery. Traffic can be a little frustrating around San Francisco, but it thins out the further north you get. Plenty of places to stop for fuel or food. on October 12, 2018 1 out of 1 members found this review useful. One of the most scenic and breath taking routes along the northern California coast. Especially, if you continue and take HWY 1 all the way up through Oregon and WA. Jaw dropping views of the coast and of the Humboldt Redwood Forest. As one of the reviewer stated, best times to ride are in early fall and spring to avoid traffic. The temps are in the 50-60 F, which is perfect for riding. Lots of places to eat and stay. While in Point Arena, stop at the Zen House Motorcycle Shop to see restored vintage European, Japanese and American motorcycles. Then, walk up the street and stop at the Little Green Bean for a great cup of coffee. As you ride up north, stop in Mendocino, which is just north of Big River Beach. Tour the shops, and don't forget to drop in to the Harvest Market at Mendosa's for a warm and tasty bowl of clam chowder. Go to the back of the market to the deli section. There you'll see the big silver pot. The roads are excellent, with lots of variety in elevation and curves. It's a riders dream ride, and at no time will you ever get bored, I promise. California and nature at its best! on April 26, 2015 1 out of 1 members found this review useful. I rode this as part of a 5000 mile 2-week road trip. I chose to stick to the coastal roads the whole way. Stunning views, great ride. I rode the coast all the way from Napa to Port Angles, WA. We just got back from this trip, we did the coastline all the way up to Newport Bay in Oregon. Amazing views, roads were overall very good, couple rough spots, found great places to eat and the weather was perfect! Highly recommend if you like twisty roads this is for you!